The mighty Black Knight rides again! Players now have the chance to battle him and his Legions in a feature rich Mechanical Action Melee of sound and light. 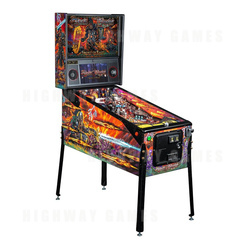 Featuring stainless steel ramps, chrome wire ramps and magna-save magnets, players are ready to take on the Black Knight in Stern's Black Knight: Sword of Rage Pinball Machine. But watch out for the interactive Black Knight himself. With a spinning flail and power shield and speech synced RGB LED helmet lights and eyes, he is a formidable foe. He is also voiced by Steve Ritchie with other characters played by Ed Robertson and many others. Black Knight: Sword of Rage features a 12 gauge stainless steel flail lane floor which protects the playfield and includes laser-cut lightning bolts, as well as a Lexan transparent Upper Playfield with 3 entrances and a unique catapult 3-Ball lock device. The cabinet contains grogeous classic hand-drawn artwork by legendary pinball artist, Kevin O'Connor, and spectacular video art and animation. It also includes classic music, speech and sounds of the Black Knight in a special retro mode. Lexan Upper Playfield with 1 Full Sized Flipper, Orbit Lane, Target and 3-Ball Catapult Multi-ball lock mechanism.